with four different focal lengths but with the same lens! 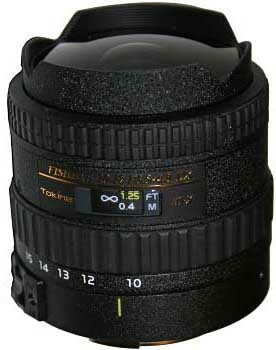 When reading the relevant Tokina (Pentax) technical documentation, I had assumed that this (Pentax) Tokina zoom fish-eye lens could probably be an excellent tool for the enjoyment of the panographers who were gifted with a Canon FF digital camera such as the EOS 5D. Caution: The removal of the sun-shade of the Tokina 107 is much more difficult than on the Nikkor 10.5 mm fisheye. It is made of cast aluminum and it is an integral part of the front mechanical structure of the lens. It is also probably the retainer element of the front lens metallic ring. Therefore I do not advise to attempt such a risky operation to unexperienced mechanists: it may be harmful both to the front glass surface and to the fish-eye lens integrity if it is not performed with extreme care. To find the main hidden characteristics of the "shaved" lens and principally the real useful Angle of View captured on the Canon EOS 5D sensor. As a challenge and for the fun of it, we may attempt to answer all these different points with the help of only a single -and unusually complex- spherical panography! Four portrait shots in an horizontal plane, 90 degrees each apart, from the next with a Canon EOS 5D (ISO 100 + RAW). Each photograph was shot respectively at 10 mm, 12.5 mm, 15 mm and 17 mm of focal length on a tripod fitted with a home-made panorama head without any other setting modification between each shot. The complete range of focal length is thus demonstrated. All were done at f/4.5 that is the maximum aperture possible at 17 mm setting. 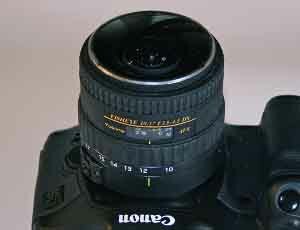 The lens was first auto-focused (@10 mm focal length) and then the auto-focus has been disabled for the entire session. Manual exposure mode. Triggering with wire remote. The four images RAW files were then processed with ACR CS3 (16-bits TIFs). The chromatic aberration and vignetting were identically removed or reduced on all four images with a common single preset. PTGui was then manually used where every images was described as being different from the next (see the table above). Control Points pairs were manually selected. This is the PTGui script . Beware: QTVR 4 Mo !! The output panorama was proposed by PTGui to be 12300 x 6150 (!) in maximum size. I have selected to get only a "reduced" but more suitable 7000 x 3500 version. The equirectangular file was processed (with some light-and-shadow trimming) in PS CS3 but no sharpening was then applied. 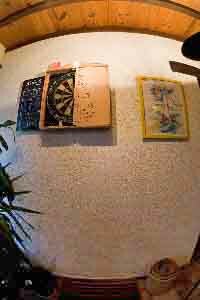 The useful Angle of view of the "circular" image that is captured on the sensor (from 10 mm to about 15 mm) is about 185 to more than 190 degrees depending on the crop setting. This is what I personally expected in the precedent study. Some additional Angle of View could eventually be set free by further trimming of the metallic scar from the "shaving" with a file tool. But I choose to stay at this safer level that is certainly large enough for a "normal" panographic use. 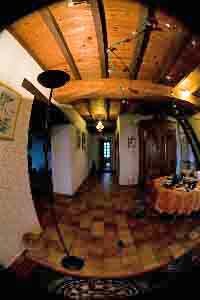 A complete 360 x 180 panorama can be easily got from three shots in the lower part of the focal length range. Of course in the (15 mm to 17 mm) focal length upper range, the image is of the pure fisheye "full-frame" type. The NPP is classically located on the optical main axis of the lens and in the plane that is containing the front of the metallic retainer ring for a 90 deg incidence angle in the object space. It moves backward when the incidence angle is reduced. This should be the case when longer focal length (multi-row) would be used. At the same time the front lens move principally forward from the camera while elongating the focal length setting. Altogether the NPP stays ALMOST still. This is why the above intricate panorama could be done: the parallax induced errors are small even though the four shots were 90 degrees apart! The sharpness is very good (or excellent) and homogeneous all over the images respective coverage and over the focal length range. 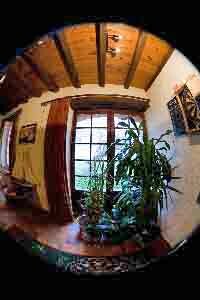 This is a very good fisheye lens that can seemingly be compared favorably with other fixed fisheye lenses. What a personal surprise, I didn't expect such a performance from a zoom! More testing, including flare resistance check is yet to be done and reported as a addendum to this previous fish-eye lenses comparison. Another panography with complementary shots to the ones above allows to better see the impact of lens zooming on sharpness. 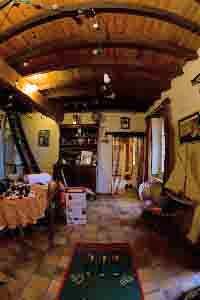 Some panoramas were done from a field test of the lens.